How does one change their fate? And does something like that even exist in the first place? How do you break out of your daily routine? Resign and keep on going, hoping that one day eventually something will change? Or gather all your courage, every tiny piece of it, to step out of the trott and into the scary unknown? 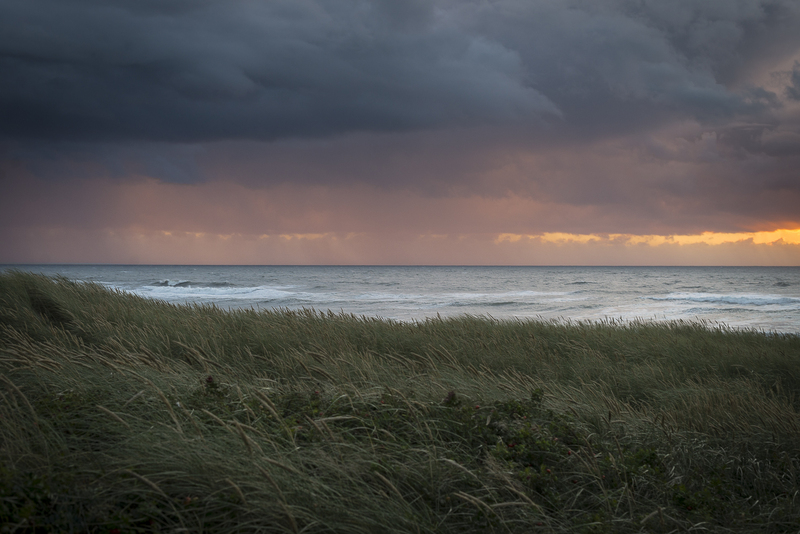 Don’t those moments, filled with nervous heart-throbs, guide us most and get us to exactly where we have to go in life? Sometimes all it takes is one single step ahead, no matter how small. And some morning we’ll wake up and will be happy about that one moment when we decided to be brave for a second. 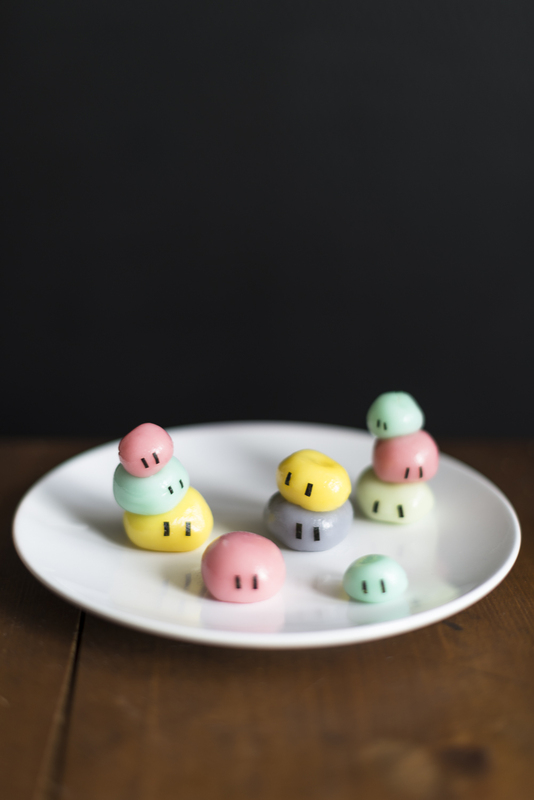 For more courage it helps to hum the Dango Song from time to time and to make some of these traditional Japanese sweets out of rice flour, water and sugar for yourself, too. If you have never had some before their consistency and taste might be a little strange at first. But I’ve become to like them a lot. And not just because they remind me of my favourite anime series: Clannad. 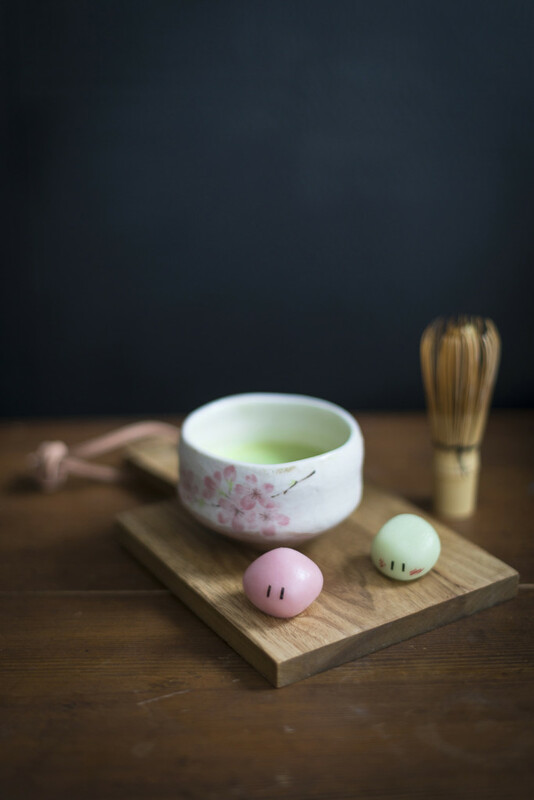 Dangos are easy to make and go very well to a green Japanese tea. 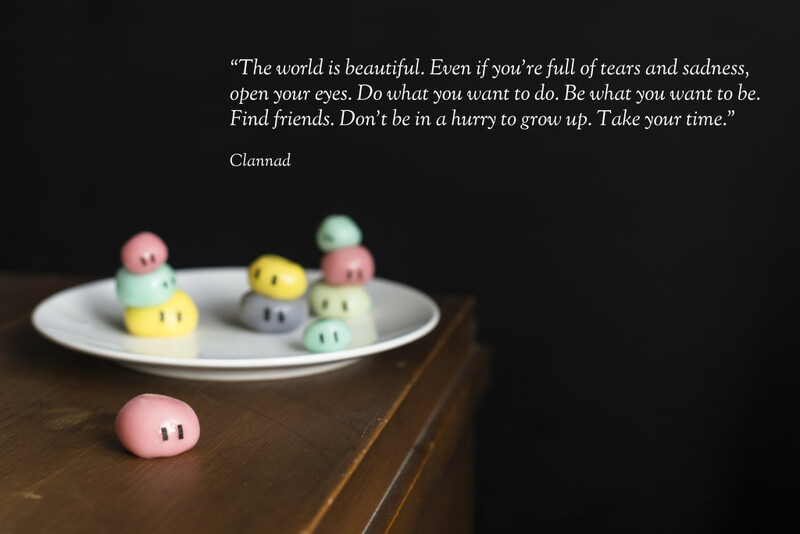 And if you’ve ever watched Clannad you might smile happily and at the same time feel a little bit sad while eating them. Mix rice flour and sugar and slowly add the water while kneading until you have a smooth, firm and formable dough. If you use liquid food colouring you might want to make the dough a little too dry at first so it won’t become runny after dying it. Divide the dough into a few portions and add a little bit of food colouring to each. Devide into smaller portions and use your hand to roll them into balls. Pour water in a pot, bring it to a boil and carefully add the dango. Make sure they don’t stick to the bottom of the pot and let them cook until they start to float on the water surface. Fish them out and put them in ice water to stop the cooking process. Cut the nori into small pieces for the dango eyes and decorate the rice balls with them. Add blushing cheeks with red food colouring if you like, arrange them on a plate and serve with some matcha.